Lately people are talking all about autism’s rising statistics. They bring up numbers like one in eighty-eight and say things like now it’s one in fifty-five and they wonder where is it coming from why so many more? But some days, I don’t give a damn about the numbers. In fact, when people mention the numbers, I want to put my hands over my ears and shout stop talking about the numbers I know all about the numbers and the statistics and the gluten-free and the hyperbaric chambers and the genetics and the therapy dogs and the vaccinations and the allergies and the blah blah blah. Because you see, Jack, my son has autism. When you were first diagnosed eight years ago, I didn’t know a single person who was on the spectrum. In fact, my only experience with autism was from this movie called Rainman with Tom Cruise in it. I was terrified when you didn’t talk. You didn’t point or make eye contact or recognize us. So we began the roller coaster of evaluations and paperwork, and learned new terms like joint attention and pervasive developmental disorder and global delay. But, still, we thought you would outgrow it. Your father and I were convinced this was just a hiccup; we’d get you some speech and you would start talk and this would all be behind us. But you’re nearly ten now, and you haven’t outgrown it. There were so many things Daddy and I didn’t know back then. We didn’t know how long and loudly a three-year old could throw a tantrum in a crowded grocery store. We hadn’t understood the amount of self stimulation–or stimming–one small boy could do throughout the day; whirling and jumping and grunting and hopping. We couldn’t figure out how to tame the slithering snake of anxiety that threatened to steal your six-year old smile. We never anticipated the power of family, how each in their own way your three brothers and one pink sister would push you along, yet pull you closer; keeping you in our world even when you’re drawn to autism’s more compelling inner universe. Or how we watched the Wizard of Oz for the thirty zillionth time last month, and when the movie was over you said, “The Lion. He has autism.” Stunned, I asked you why, why you thought that. And that might have been the single most heartbreaking thing I have ever heard. But you are so brave Jack. Every day you wake up and pull on your khaki pants and your favorite striped shirt, and face a world that is not made for you – a world full of loud fire drills and people who talk too fast and long, busy math worksheets. A world of Jack not this way, do it that way, that’s not right. But you wish you were normal, I know. You are in a tender place because you’ve just begun to discover you have a diagnosis. And although we count our blessings to be able to consider you high functioning, there is a price to having one foot firmly planted in the typical world and the other planted on the spectrum. That price is the knowledge you are different, diagnosed, not normal; the knowledge that you have an aide but your brother Charlie does not. I have a lot of hopes for you, Jack, and one of my biggest hopes is that there comes a day when you appreciate your autism as much as I do. Now, I appreciate your autism but I do not always love it. Or understand it. Or have patience for it. Take this morning, for example. I just wanted to make my cup of coffee and have a few quiet sips before I brought you guys to the bus stop. I did NOT want to listen to a lecture about why the K-cups should stay organized in neat little rows according to flavor and color. I wish I could show people all the license plates you and Daddy hung on the wall in the playroom. For over a year you were obsessed with them, and when people heard about that, they started to mail them to us. One by one they pried them off their old cars and trucks and motorcycles, and sent us Nevada and Tennessee and Georgia and Missouri, until we had collected all fifty states. I want to tell everyone that yes, the statistics for autism are mysteriously on the rise, but I think the world is ready. And we have a wall full of license plates to prove it. A lot of times people ask for my advice about autism. They want to know if I have any idea about how to increase language or make the tantrums stop or reduce anxiety. And I always wave my hand and chuckle say something like no, no, everyone is different I can barely figure out Jack. But when I tell someone this—that I don’t really have any advice to give—a memory pulls at my subconscious. It’s a memory I have from last summer, when our family took our first camping trip with together. You were so, so excited, Jack. Remember? We bought a 10-person tent so the entire family could sleep together. We bought an air mattress so Daddy could rest comfortably on the tricky bulging disc he’d had for months. And after we set up the tent and all five of you kids took turns rolling around on the air mattress and digging your dirty feet into our pillows, we decided it was for only the grown-ups and shooed you off of it. When nighttime came, the temperature dropped right along with the sun, and by late evening it was in the low fifties. We bundled into sweatshirts and pajama pants and all climbed into the tent to sleep. Somewhere around 2:00 am you called for me. “Mom. I want to sleep on the mattress.” I told you no, you needed to go back to sleep before you woke everyone else up. “Mom. On the mattress,” and I answered no, go back to sleep. I drifted back to sleep myself, wondering why you were being such a pest. As the morning sun streamed through the trees I looked down and realized that sometime in the night you had wriggled out of your pajama pants. You weren’t wearing the white t-shirt you had put on before bed. All night long, you were cold. Freezing, probably. Once again I was foiled by the limits of your expressive language. I can’t tell you how many times I’ve thought about that night, how I told you to go back to sleep. And every time I think about it, I hate myself. I make mistakes. Every day I make mistakes. Last Tuesday you were in the school play, Thwacked. You had a pretty big part as one of the frogs. For about forty-two minutes I watched the performance with a knot in my stomach. I watched anxiously as you stimmed and jumped and hogged the microphone. When other kids hesitated to say their lines you shouted them out impatiently. I was so nervous you would tip over the microphone or scream out something rude or stim yourself right off the stage. But for the last ten minutes I made myself relax. I made myself sit back in my metal folding chair and uncross my arms and just take it all in. My son is in the school play. 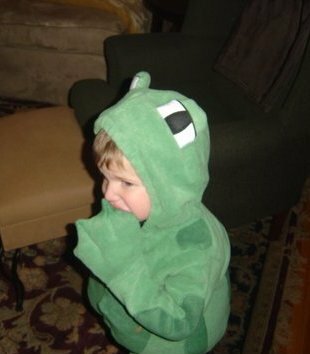 And watching you sing it occurred to me: nearly eight years later, you were wearing a frog costume. When people ask about your autism, maybe I should just tell them the truth. I should tell them all of the things the statistics don’t say. Autism is confusing and scary and messy and beautiful and green and warty and electrifying. It can eat a marriage up alive and baffle the grandparents and make me laugh out loud. It is heartbreaking and yet it is ordinary. Because of autism, I’ve learned that all I really need to do is listen even when there are no words, and try to feel the Lion’s fear in your heart. Most of all, I need to warm you when you are colded. Jack, the truth is this: my son has autism. And I love you more every single day. Jack and a fellow frog. 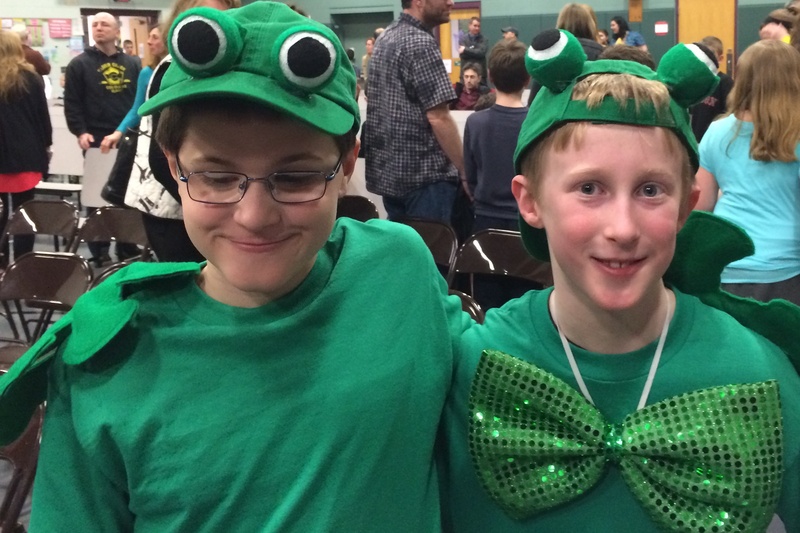 Jack did a fantastic job as frog in the RBS play! He had a lot to memorize and did it all beautifully. This is another beautiful essay, Carrie. I’m so glad you added your voice to the Messy, Beautiful Project. Thank you. That was enlightening. None of my sons has autism but it was interesting to learn a little about Jack.